I was watching the news the other day. After reporting on the humanitarian crisis in Syria and another European economy collapse, there was a piece on a young woman of a similar age to myself. She had been kept prisoner in a house in the UK for a number of years and been repeatedly raped and tortured. I had to turn the TV off. I just couldn’t believe that I lived in a world where these sorts of things happen in the first place, are then reported on the news almost as if it’s entertainment, and there’s very little I can do about it. I remembered Sarah (an old colleague of mine) and the project she founded, the Craftivist Collective, which is actually doing something to tackle all the unjust and unacceptable things about the world we’re living in at the moment. I went along to a Stitch In, bought myself a mini protest banner kit and got to work. I decided to stitch Ghandi’s ‘Be the change you wanted to see in the world’ – not just because it was short and I wasn’t sure if I had any sewing skills – but Sarah has this tattooed on her skin, and to me she is a personification of exactly what Ghandi meant. I was reminded of another brilliant quote from the Dalai Lama: ‘it’s not enough to be compassionate – you must act’. That’s exactly what the Craftivist Collective is all about. 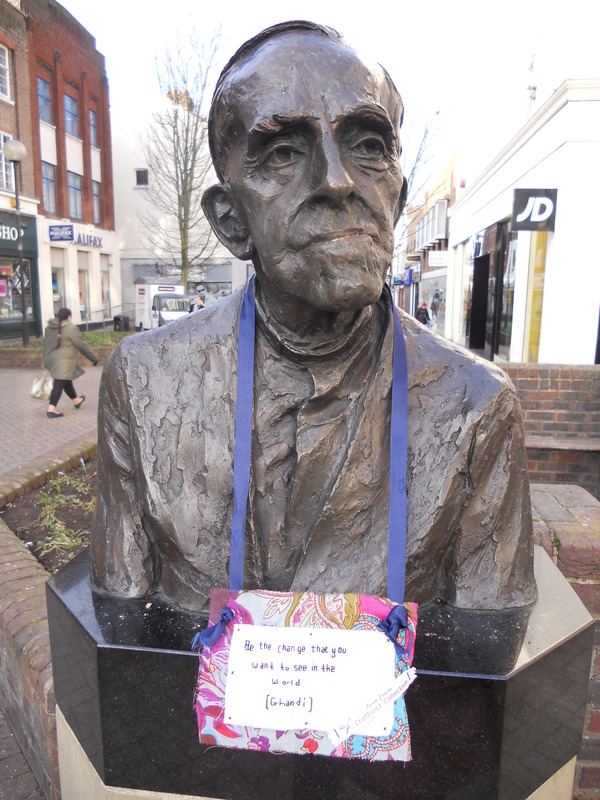 I hung my piece of Craftivism on a statue of Trevor Huddleston in Bedford Town Centre. Trevor was an anti-apartheid activist in South Africa during the 1940s and 50s – another person who tried to ‘be the change’. That looks great, Safiya, thanks for having the courage to do it. I think Trevor Huddleston would have liked craftivism. That’s really brilliant- it’s a really clever idea and you are right, an active way of dealing with something you feel strongly about. 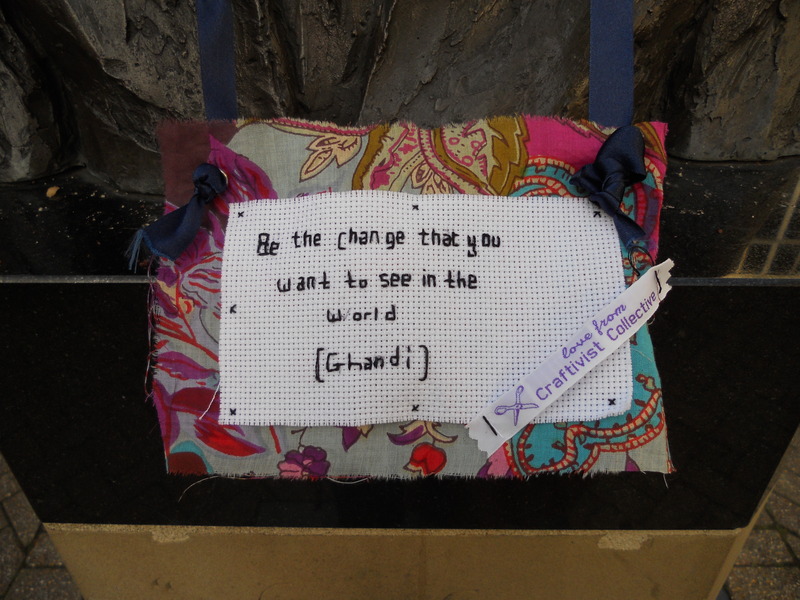 I am just becoming so inspired by the guerrilla art, yarnbombing and craftivism movement. I love that you can use crafts (so often dismissed as plain/boring/ and not pertaining to fine art) to help make change, bring positivity to the people, it is so empowering. 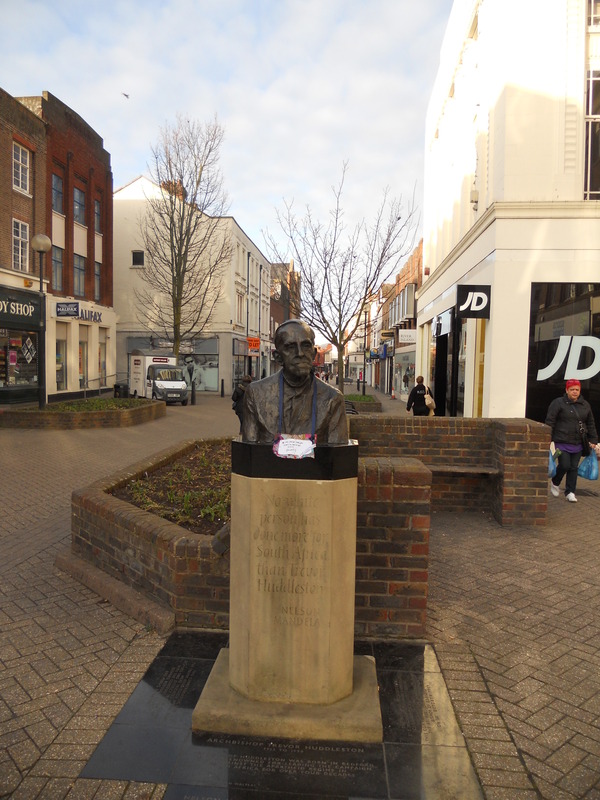 I intend to get better at yarnbombing, do lots of things to the urban landscape I live in and try and make people smile and occasionally make them think..about some of the things you say (quite rightly) is often ignored/nothing is done about.